In TWM, we offer solutions for the integral management of waste and cleaning of your industrial and commercial processes. 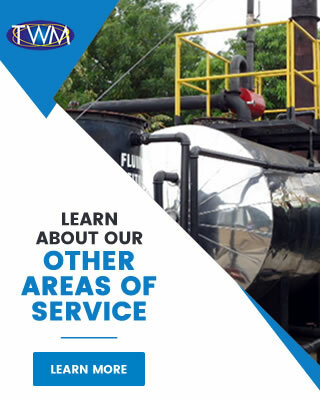 We deliver a comprehensive solution for the management of hazardous, non-hazardous, solid and liquid waste, and the cleaning of facilities, all through a single supplier. Waste recovery is our primary objective. We give advice and solutions with the aim of avoiding and/or minimizing the generation of waste and optimizing the maintenance of facilities. We provide security and confidence to our clients thanks to our management that includes partnerships with companies that comply with Colombian environmental legislations for the treatment and final disposal of waste. Trained personnel for the execution of a safe and high quality operation, inaddition to complying with the training for the transport of dangerous goods specified in Resolution 1223/2014. With the premise “Safety first”,our staff has all the personal protection elements required for each activity to be executed. Own vehicles in order to deliver a safe and controlled service by means of GPS and complying with the requirements of Decree 1079/2015 (Decree 1609/2002). With our wastewater treatment plant, or through our partners, we offer the treatment of domestic or industrial wastewater and its proper final disposal. In our plant, we have aland farming bioremediation process which is an alternative treatment that allows reintegrating contaminated sludge and soil back into the environment. With our own portable sanitary units and vehicles for their maintenance, we offer the rental service and cleaning/maintenance of portable toilets. With the objective of supporting the cleaning of industrial and commercial facilities, we have ourown vehicles, such as vacuum and vactor trucks, to perform drilling, cleaning and suction of liquids to boxes, tanks, dikes, grease traps and septic tanks.